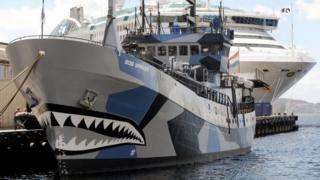 Anti-whaling group Sea Shepherd has announced it will not intercept Japanese vessels in the Southern Ocean this season. The anti-whaling group's ships have confronted ships off Antarctica each year since 2005. Sea Shepherd founder Captain Paul Watson said the group could no longer match Japan's surveillance technology. He accused nations including Australia, New Zealand and the US of being "in league" with Japan. "Japan is now employing military surveillance to watch Sea Shepherd ship movements in real time by satellite and if they know where our ships are at any given moment, they can easily avoid us," Mr Watson said in a statement. He told the Australian Broadcasting Corp: "We do not have their money, we do not have their technology. We are going to have to find an alternative way to deal with them and we will." Mr Watson did not detail potential future tactics. Despite an international moratorium on whaling since 1985, Japan's fleet sails to the Antarctic in the autumn or winter each year, returning the following spring. Mr Watson said the Sea Shepherd was largely responsible for reducing Japan's annual whaling quota from 1,035 in 2005 to 333 at present. In 2014, Australia successfully won a temporary ban on Japanese whaling in the International Court of Justice (ICJ). However, Japan resumed whaling a year later, claiming that its fleet had satisfied ICJ requirements about conducting scientific research. Australia, New Zealand, the US and other nations have maintained public opposition. In January, Australian Environment Minister Josh Frydenberg said he was "deeply disappointed" that Japan had resumed another whaling season. However, the three nations were accused by Mr Watson of having "hostile governments" who did not challenge the programme in any genuine way. "We are trying to do the job that Australia, New Zealand, the United States and other nations should be doing, but they are too busy appeasing Japan," he said. Mr Frydenberg said: "No country has done more than Australia to try to end Japan's so-called 'scientific' whaling, particularly in the Southern Ocean. "The Government has made representations at the highest level in Japan and we are working hard through the International Whaling Commission (IWC) to end any commercial or so-called 'scientific' whaling and promote whale conservation."